The Human Expression released a pair of mind-blowing garage-psych singles in 1966 and 1967 that are today regarded as among the most exciting and original of the era: “Love at Psychedelic Velocity” and “Calm Me Down” / “Optical Sound.” In this issue the band members tell their full story for the first time. Stu Boy King was the drummer for The Dictators’ seminal debut album Go Girl Crazy! He talks here in-depth for the first time since his ejection from the group in 1975. We also have fabulous exclusive interviews with the late Dave Hassinger (studio engineer for the 1964-66 Rolling Stones 1964-66, Jefferson Airplane, and the Electric Prunes, Steve Katz (Blues Project; Blood, Sweat & Tears), and Denny Tedesco, director of The Wrecking Crew. 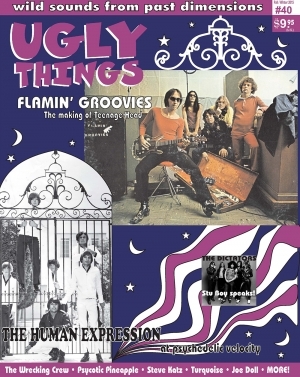 Also, Cyril Jordan of the Flamin’ Groovies revisits the years 1970-71 and the making of the seminal Teenage Head album. We also have eye-opening stories on San Francisco’s demented proto-punks Psycotic Pineapple, a drug-scarred Santa Barbara ‘60s saga starring Turquoise, UK ‘70s punks Red Lights (“Never Wanna Leave”), Michigan garage greatness with Joe Doll, The Beau Biens and the aftermath, plus Hamilton & the Movement, Phoenix, Los Free Minds, Mickey Finn & the Blue Men & more. As always there’s also our instructive review sections covering all the latest reissues and rock‘n’roll-related books.